Compact, ultra-lightweight design and powered via built-in rechargeable lithium batteries. 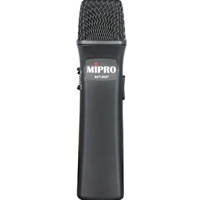 Quality condenser microphone capsule ensures loud and clear vocal quality. ACT-222T can be a handheld or worn as a neck lanyards for hands-free operation. Built-in level control allows volume adjustment of MA-202 portable PA wirelessly. Amazing 24 operating hours per charge. Can be re-charged and stored inside MA-202 portable wireless PA system. A single ACT-222T wireless mic can broadcast to multiple MA-202 (same frequency) for expanded coverage.